The blue band curving across this image is created by the dust disc surrounding our Solar System. Viewed from afar this would show up as a bright ring surrounding the Sun. 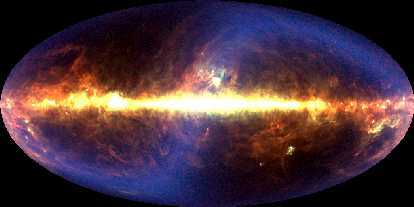 The bright band running across the centre of the image is from dust in our Galaxy. This image, taken by the COBE satellite, is a composite of three far-infrared wavelengths (60, 100, and 240 microns).